My 4-year-old Liam had a good time trying on the over sized coat at PDQ. We promised him a milkshake and chicken if he was a good sport and modeled the coat for PDQ’s partnership with The Salvation Army. 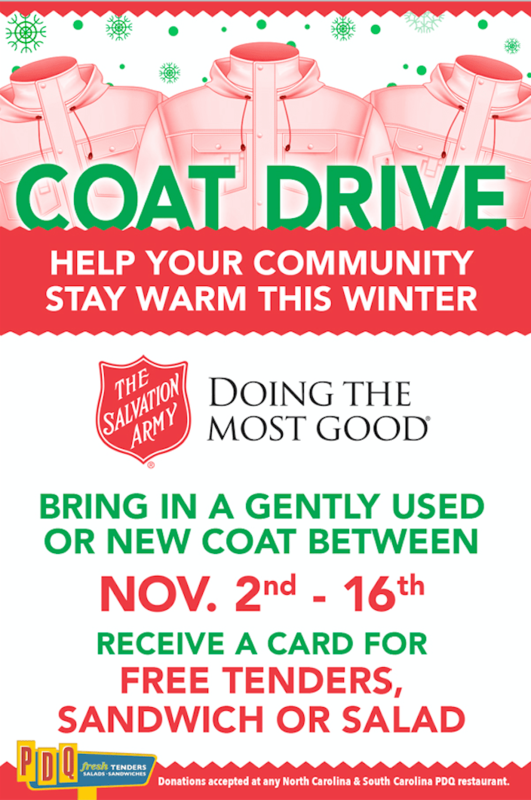 While my son may not understand the impact of the community bringing new or gently-used coats to their local PDQ in North and South Carolina, many children and adults will be very grateful. 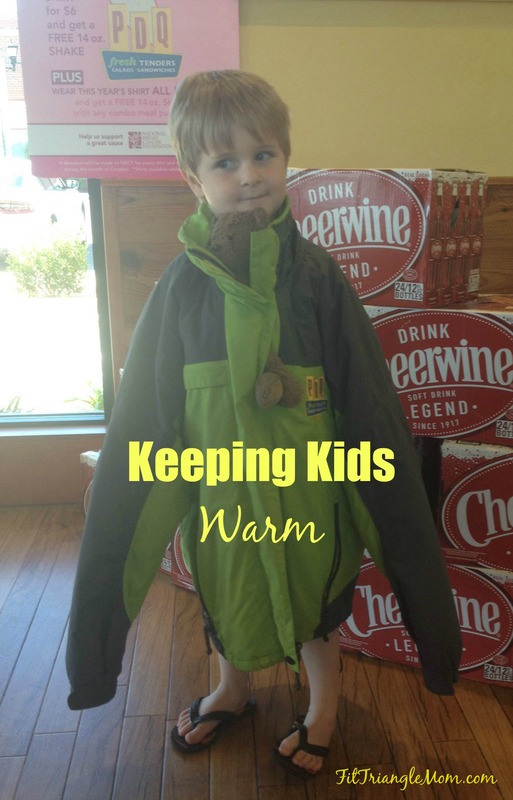 From November 2- 16, you can make sure families don’t have to choose between eating and staying warm by bringing a jacket, coat or sweatshirt to your area PDQ store. When you make a donation, PDQ will give you a coupon card for a free tenders, salad or sandwich to use at your next visit. A new or gently-used coat will keep kids warm while they wait for the bus and play outside, but most-importantly it will keep families from choosing a meal or a coat. I was compensated for this post. Please see disclosure/disclaimer for more details. What a great idea and so nice of PDQ to not only accept the donations, but offer a little perk too. We were at PDQ a few weekends ago and I saw that they had the sign up. I need to get some stuff together and bring it there. I have wayyyy too many coats laying around from my “living up North” days! Andrea B. recently posted…Parents Are Always Prepared. Right? Yes, bring them your coats and be rewarded with a get tenders, salad or sandwich free card. Thanks for writing this up. I”ll be sharing in on my channels. I’ll tell PDQ that I’ll share yours and then maybe scope there. Want to have lunch there sometime? Thanks, Leigh for spreading the word. Lunch at PDQ would be nice.